Following on from its successful season last year, the Multi-Storey Orchestra is back for a season of concerts in its Peckham car park. Programmes include a new work by Kate Whitley, setting words by Sabrina Mahfouz which will be performed by a choir of 100 Peckham school children alongside The Multi-Storey Orchestra. Then there will be Aaron Copland's Apalachian Spring. Even more amazingly there will be performances of the first three parts of Grisey's amazing Les Espaces Acoustiques, a milestone of French Spectral music and one of the defining works of the 20th century. This multi-part score, written in the 1970's by French composer Gerard Grisey (1946-1998) uses different scorings for each of the parts and was written after Grisey returned from his stay in Rome as a result of winning the Prix de Rome. 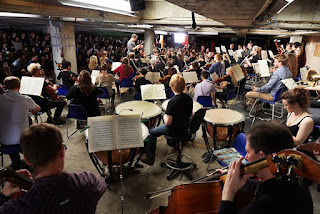 The final event of the season is a performance of Beethoven's Seventh Symphony preceded by a Living Programme Note directed by Fraser Trainer and Matthew Barley in which the audience will be taken on a unique and personal encounter with the symphony across all four levels of the car park. There is also a new chamber music series, with performances of Messiaen's Quartet for the End of Time and John Cage's Living Room Music in an auditorium made of straw bales - the strawditorium! Concert season runs from 1 July 2015 to 13 September, see the orchestra's website.